Here’s an interesting project — using a second-hand barrel to upgrade an AR15. Our friend Erik Cortina decided to make his AR15, originally chambered in 6.8 SPC, into a 6.5 Grendel. Erik acquired a “pre-owned” 6.5-06 match barrel through our Shooters’ Forum. Erik inspected the barrel with a bore-scope and confirmed it was in good shape after the first few inches (past the chamber). The 6.5-06 barrel had more than enough length, so he trimmed off the chamber end, then contoured the barrel to fit his AR15. This is a smart way to upgrade a gun without spending $350 or more on a brand new barrel. Share the post "Cortina’s Corner: Rebarreling an AR15 to 6.5 Grendel"
A while back, Roy Bertalotto acquired a budget-priced Kimber 82G rimfire target rifle from the CMP. The Kimber comes with an oiled-wood stock that works fine for three-position training, but Roy wanted to shoot the gun for the bench. The original Kimber stock, with its narrow, radiused forearm, was not ideal for this purpose. Roy wanted a wide, flat fore-end, which is much more stable in the bags. Rather that spend hundreds on a new benchrest stock, Roy modified his Kimber’s original stock by slicing a section off the bottom of the stock and then replacing this with a 3/4″ X 2 3/4″ X 15″ piece of walnut. Share the post "Home Shop Project: Modifying a Kimber 82G for Benchrest Use"
If you’re thinking about acquiring a 17 HMR rifle, you should read the 17 HMR Two-Gun Comparison in our Gun of the Week Archives. This two-gun shoot-out compares the performance of a Volquartsen 17 HMR semi-auto and a Ruger 77/17 bolt-action. Glen Robinson, the owner of both rifles, has done some serious comparison testing with both guns, trying out a half-dozen varieties of 17 HMR ammo. The overall results may surprise you. The semi-auto out-shot the bolt gun by a significant margin, with all types of ammo tested. Ruger Strong Points: From any angle, the Ruger 77/17 is a nice-looking rifle with classic lines. I like the gray-finish stainless barrel — it goes well with the gray laminated stock. With the addition of the aftermarket sear, the trigger is crisp and the bolt function is smooth. The action is strong and dependable. The conventional “open rear” action allows you to clean “normally” with a bore guide, cleaning rod, and patches/brushes. I feel I can do a better job of cleaning with the Ruger than with the boresnake on the Volquartsen. Share the post "17 HMR Shoot-Out: Ruger vs. Volquartsen"
Geissele Automatics, respected maker triggers and firearm accessories, is offering some very attractive specials on Black Friday and Cyber Monday. On Friday 11/27 get 25% AR triggers. On Monday get a complete Geissele AR 2-Stage Trigger (GS2) for just $115.00. These normally retail for $165.00, so you save fifty bucks. In addition to these great deals, you can get 50% off Geissele gear, and 30% off Reaction Blocks (used for assembling AR platform rifles). Share the post "Got Geissele? 25% Off Triggers on Black Friday"
Click photo to go to game site. OK, you’re feelin’ fat and happy after the traditional Thanksgiving Day feast and you need to kill some time. Sure you could rake the leaves or wash the dishes, but why not have some mindless fun targeting turkeys with this online video game? Be forewarned, the sound effects (gobbling, annoying music, and loud bangs) may frighten your pets and annoy your family members. Also the game gets rather manic near the end, with multiple gobblers popping up all over the screen. That said, have fun, and enjoy your Thanksgiving holiday! 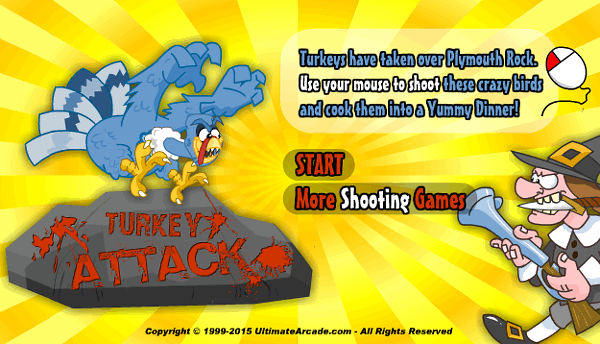 CLICK HERE to access Turkey Attack Game. WARNING: Very Loud Noises, Shooting Sounds, and Annoying Music. NOT Recommended for Work! We suggest you turn down your speakers before playing. 1. Center your aim after moving left or right. 2. Some turkeys have armor on them and need to be shot twice. 3. When two turkeys are overlapped you can hit both with one, single shot. 4. The turkey with the white flag is fair game and will increase your point total. 5. Click in the upper right hand corner of the game screen to mute the obnoxious music. Share the post "Turkey ATTACK — Help the Pilgrims Survive Thanksgiving"
Sierra has released two new Tipped MatchKing (TMK®) bullets that should find favor with PRS competitors and tactical shooters*. Sierra is producing a new 95 grain 6mm projectile and a new 130 grain 6.5mm bullet. Both feature acetal resin tips that lower drag by improving the ballistic coefficient (BC) and making the BC more uniform from bullet to bullet. The 95-grainer should work well as a higher-speed option in the .243 Win, 6mm Creedmoor, 6mm Dasher, and 6mmBR. We were able to push other 95gr bullets nearly 100 fps faster than 105gr bullets from a 6mmBR. For those shooting the 6.5×47 Lapua and 6.5 Creedmoor, the new 130gr TMK should be a near-ideal bullet weight. We know that Berger’s 6.5mm 130gr VLD works great in those mid-sized cartridges, so Sierra’s new 130-grainer should be in the “sweet spot”. Also, in the .260 Remington the 130gr TMK should be capable of velocities that hit predicted accuracy nodes with ease. The 6mm 95 grain TMK requires a twist rate of 1:9″ or faster to stabilize while the 6.5mm 130 grain TMK requires a twist rate of 1:8″ or faster to stabilize. * In addition, Sierra plans to add a 7mm 160gr TMK to the line-up, product #7660, but we don’t expect this to be used for tactical games because of the heavier recoil. Share the post "New 6mm and 6.5mm Tipped MatchKings from Sierra"
Many Northern States have been hit by some early snowstorms dropping lots of the white stuff. Think a little snow should end your shooting season? Heck no — just grab your snow shovel and go shooting. Here’s how Forum Member Nick (aka “ChevyTruck 83″) coped with winter’s fury back in 2012. Never underestimate the resourcefulness of a dedicated AccurateShooter Forum member…. Share the post "Love Shooting? Then Go Despite the Snow…"
Creedmoor Sports is having a big sale on printed books. On sale now are many of the most popular training and competition books. If you are looking for some good reading material this winter, check out the Creedmoor Book Sale. Gun books also make great holiday gifts for your shooting buddies. Among the discounted sale titles below, we strongly recommend the Competitive AR15 Builders Guide, and Mental Training in Shooting. While somewhat pricey, Air Rifle Training and Competition book is a “must-read” for three-position Airgun competitors. Share the post "Holiday Book Sale at Creedmoor Sports"
Click Calendar above to download large-size 2016 National Match Calendar PDF. It’s never too early to start planning for the National Matches at Camp Perry, Ohio. Here is the official calendar for next year’s National Matches to be held in the summer of 2016. Registration for the CMP National Trophy Rifle & Pistol Matches and CMP Games Events will open on April 1, 2016. Competitors should note that most events and matches have returned to the previous dates before the adjustment for the Palma (Fullbore) World Championships in 2014 and 2015. However, the Smallbore National Championships will be held at the Wa-Ke-De facility in Bristol, Indiana, rather than at Camp Perry. Share the post "2016 National Matches Calendar Now Available"
The 2016 SHOT Show, slated for January 19-22, 2016, is less than two months away. If you’re curious, the “SHOT” acronym stands for “Shooting, Hunting, and Outdoor Trade Show”. SHOT Show is the largest trade show in the world for the firearms, ammunition, hunting and shooting accessories industries. Held every January, this “start-of-year” event is where new guns, optics, reloading tools, and all manner of shooting gear are unveiled. To preview some of the new products that will be on display, visit the SHOT Show New Product Center. You’ll find photos and short descriptions. SHOT Show is a huge event. For 2015, there will be more than 1,600 exhibitors, whose displays collectively cover 630,000 square feet of exhibition space. SHOT Show attracts more than 62,000 industry professionals from all 50 states and 100 countries. If you plan to attend SHOT Show this year, you should get your reservation completed soon. Vegas hotels are filling up and tickets to SHOT Show Events are going fast. Register to attend the show, book your hotel rooms. and more at www.Shotshow.org. Share the post "Get Ready for SHOT Show, January 19-22, 2016"